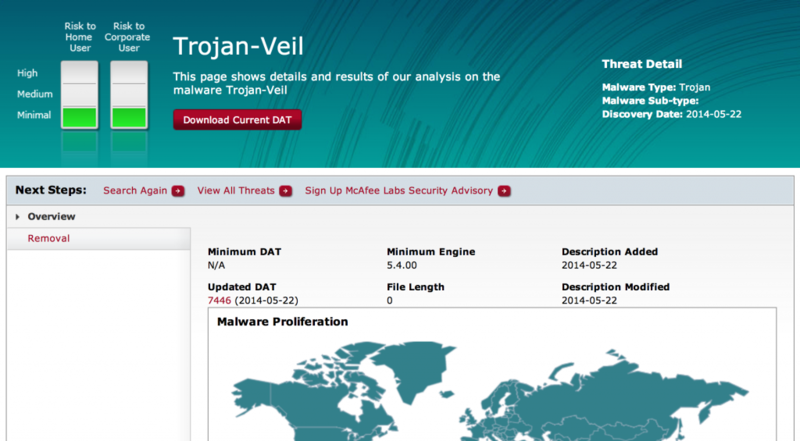 Exactly a year ago today, we introduced V-Day, our continuous release cycle for Veil-Evasion. We wanted to provide a way to systematically release our evasion research as it progressed, as well as letting everyone know that Veil-Evasion is an actively maintained and developed project. Back in May we reflected on a year of development for the Veil-Framework. We promise we won’t wax poetic again about the how far the project’s come, how much fun we’ve had developing Veil and interacting with the community, or how awesome the reception at Defcon was from everyone. Instead, we’re going to cut to the chase and detail our 1 year V-Day anniversary, our biggest release yet. These Ruby approaches are great, but you’re probably heard us iterate again and again on how we want a single monolithic attack platform. 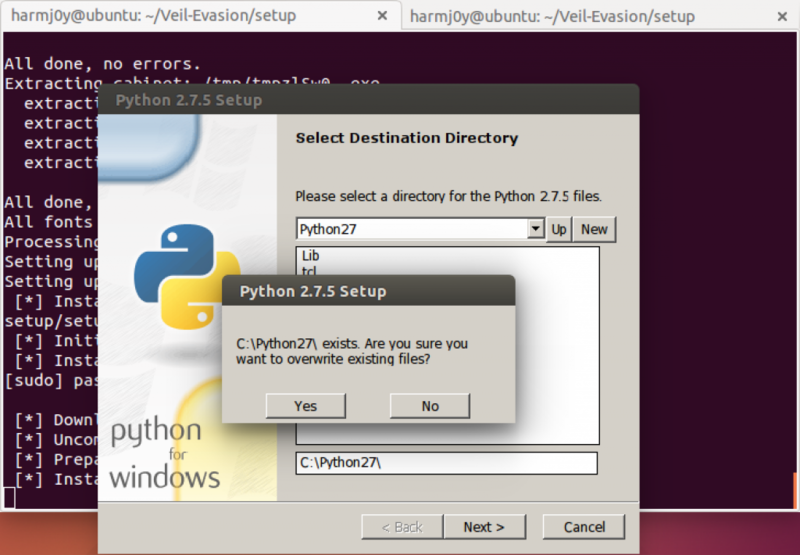 We hate having to switch back to a Windows box with a specific environment installed (Python, Ruby, etc.) in order to compile our backdoors. Hence our philosophy of trying to only release module families that can compile to Windows executables, all on Kali linux. 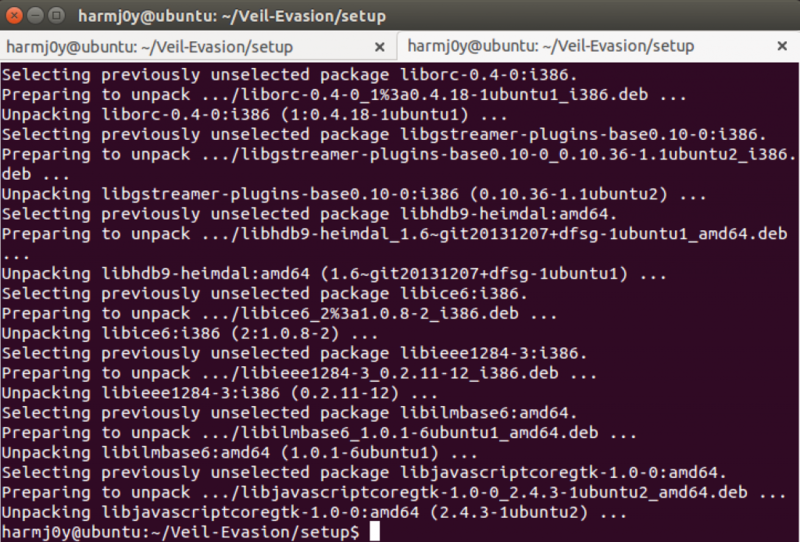 With the new update, the ./setup.sh script for Veil-Evasion will install Ruby under Wine along with the necessary gems. We’ll have a few more Ruby stagers for release next month, and I spoke about this payload family during my BSides Augusta presentation “Adventures in Asymmetric Warfare: Fighting the AV Vendors“. One of the most common requests we received at Defcon was for support beyond just Kali linux. 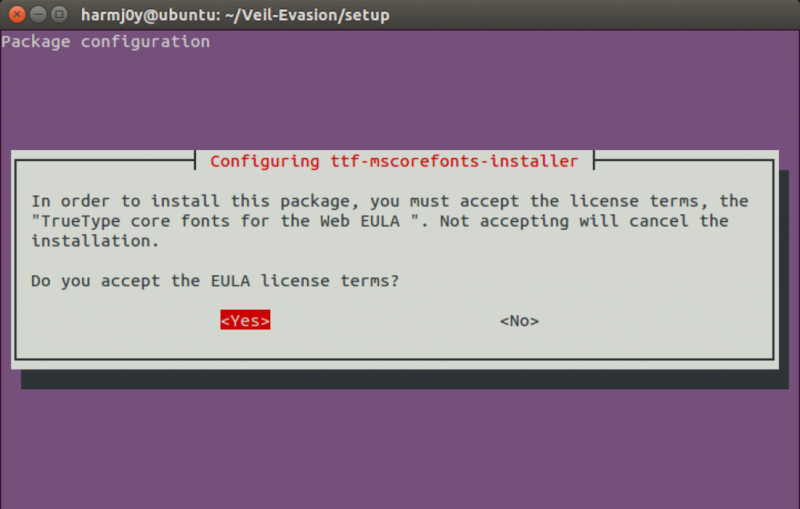 And while Kali remains as our only *officially* supported platform, we’re happy to announce that @TheMightyShiv has brought Ubuntu 14+ and Debian 7+ compatibility to Veil-Evasion, along with non-root installations! 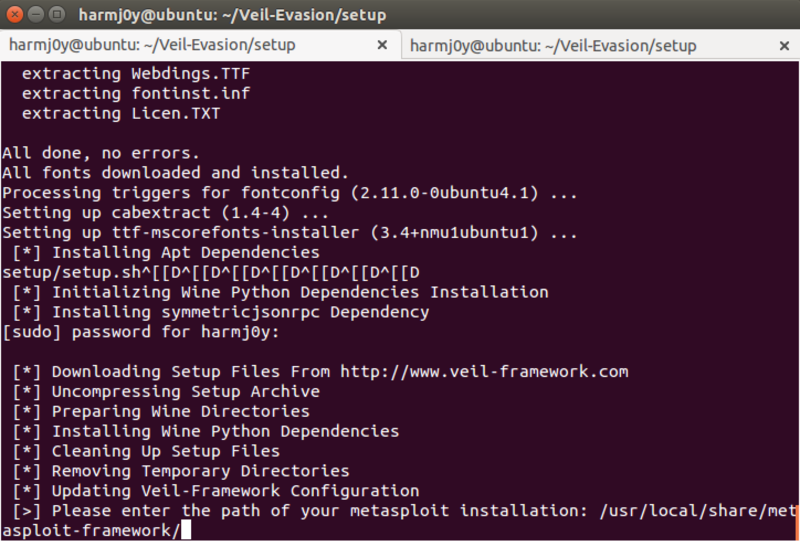 If you have a fresh Ubuntu 14 image, you can run the short setup script hosted at this gist which will install the latest versions of the Metasploit framework and Veil-Evasion. After that everything *should* run properly. There are likely a few issues we missed, so if you run into any problems please submit an issue to our github. Thanks again to everyone for all their support. We’re looking forward to another great year of releases. A few months ago, @obscuresec published a post on finding and extracting custom user properties in Active Directory using PowerShell. Veil-PowerView 1.4 added some cmdlets that integrated (read: shamelessly stole :) some of this functionality, and I wanted to briefly cover how to utilize these new methods. Data mining available file shares for sensitive data is a staple of red teaming. We’ve found everything from password lists, to full employee directories, salary information, network diagrams and more, all due to network shares with incorrectly configured permissions. Veil-PowerView has a few functions (Invoke-Netview and Invoke-Sharefinder) that have helped us quickly find and explore shares our current user has access to. I’ve talked in the past about using Powershell to triage file servers during engagements, and realized that robust, recursive file listing would make a great addition into PowerView. Those two functions (Invoke-SearchFiles and Invoke-FileFinder) were recently added, and I wanted to demonstrate how this new functionality can help you find sensitive files on the network as quickly as possible. 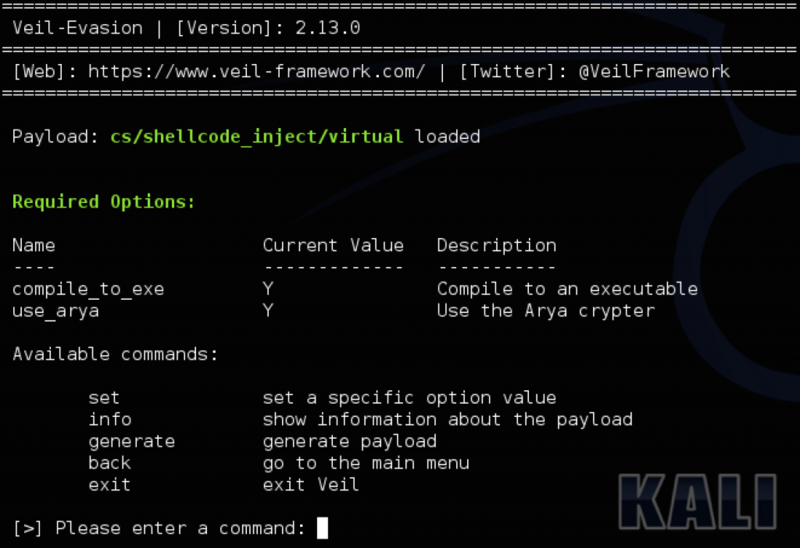 Veil-PowerView is a project that was originally prompted by a client who locked down their corporate machines by disabling all “net *” commands for normal users. While building pure Powershell replacements to easily bypass this protection, I began to explore what else could be done with Powershell from a domain and network situational awareness perspective. Being inspired by my boss @davidpmcguire, and drawing on existing work from @mubix, the offensive Powershell community (@obscuresec, @mattifestation, and DarkOperator), and the authors of various Metasploit modules like local_admin_search_enum, I began to build more interesting functionality to abuse Windows domains. Now that Veil-PowerView has been tested in multiple, diverse environments and has started to mature a bit, I wanted to put together a quick guide on using some of PowerView’s interesting functionality. All of the PowerView cmdlets will now be exposed and tab completable (Invoke-[tab]). To get more information on any command, use get-help [cmdlet], with an optional -full flag to return complete information. I.E. “Get-Help Invoke-Netview -full“. 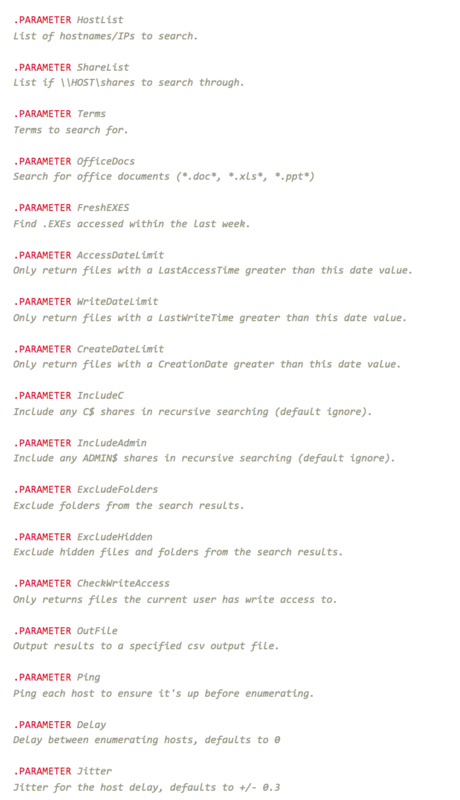 To get a list of all the available functions, check the README.md. Arguments/flags for each cmdles should be tab completable, with something like “Invoke-Netview -[tab]”. If you want to output your results to a file, I recommend using the Powershell Out-File cmdlet, I.E. ​”PS C:\> Invoke-Netview | Out-File -Encoding ASCII output.txt” (the -encoding flag is used since since Powershell defaults to Unicode). If you want detailed output for any of the PowerView commands, just add a “-Debug” flag, and if you want status output for any functions that enumerate multiple machines use “-Verbose”. There are plenty of more functions and options in Veil-PowerView than what we covered here: I encourage you to check out PowerView’s README.md as well as the descriptive comments for each cmdlet in the source which detail use cases, arguments and outputs for each function. There’s also a Metasploit module for running powershell commands through a session, post/windows/manage/powershell/exec_powershell. Before you use this module, first append the desired function and any arguments (i.e. “Invoke-StealthUserHunter”) to the end of powerview.ps1 on your attacker machine, and then specify the local path to the script in the module options. Metasploit will upload the script, run it on the target, retrieve the results and save them back to your local machine. If you have any questions on PowerView, hit me up at will [at] harmj0y.net, on twitter at @harmj0y, Freednode (harmj0y in #veil or #armitage), submit an issue on the official Github page, or come check out the Veil-Framework at BlackHat Arsenal. Get-UserProperties was built, stealing directly from @obscuresec‘s great post on the topic located here. Related, Invoke-UserDescSearch was expanded and changed to Invoke-UserFieldSearch, which now allows you to specify the user field to search for wildcard terms. We’ll have a post up soon on using these methods together. Get-NetGroupUsers was combined into Get-NetGroup for standardization. The -Debug flag for meta-functions now replaces the old -Verbose functionality, with the -Verbose flag now outputting a status for when several machines are processed. Invoke-Sharefinder had serveral additional exclusion options added and its output changed to just spit out raw share paths. Set-MacAttribute was added in from Powersploit- see @obscuresec‘s post on the topic on his blog. Invoke-CopyFile automatically invokes this when replacing files in order to match a target’s MAC properties. Invoke-SearchFiles was added, which recursively searches a local or remote network path for files with various specifications. Terms can be specific, MAC attributes filtered one, and more – check out the source for complete flags and options. Invoke-FileFinder was added, which utilizes Invoke-SearchFiles to crawl the network for target data. Lots of flags here too. Several methods were added that attempt to enumerate local machine information: Get-NetLocalGroups to get local groups on a target, Get-NetLocalGroup to get members of a local group, and Get-NetLocalServices to enumerate local services. Invoke-HostEnum was added, which will run all available host enumerate functions on a single target (note: this potentially produces a good chunk of data, just for a single host). Thanks again to @obscuresec for posting some great Powershell information that I shameless stole and integrated into PowerView – all credit to Chris for coming up with those ideas. We’re also going to have a few PowerView posts coming up in the next few weeks, including a usage guide, information on abusing user description fields, and an exe trojanation guide. Oh, and the Veil-Framework was recently accepted to Blackhat Arsenal– come stop by to talk about all the tools in the framework, including a new post-exploitation tool being released at Defcon. This past Saturday the Veil development team presented at CarolinaCon X on the Veil-Framework. It was a great experience, and we want to thank the organizers again for having us out. Our presentation was an adaptation of the one given at Shmooon 2014, with material added in for Veil-PowerView. This slides are posted here and the video was uploaded here. Thanks again to CarolinaCon, the conversations and beers we shared, and all the great feedback we got while there!